Hello my name is Corey Mummey and I from Houston, Ohio and I am 16 years old. The picture... ...is my 1986 toyota. Its got 39 1/2 by 18 in. tires underneithe it and it is a beast from hell. It has k/c's on the top and and role bars in the back. Me, my brother Richie and Our real good friend Kevin are all rebuilding it. We are puting a 350 and a 4 speed granny gear in it. 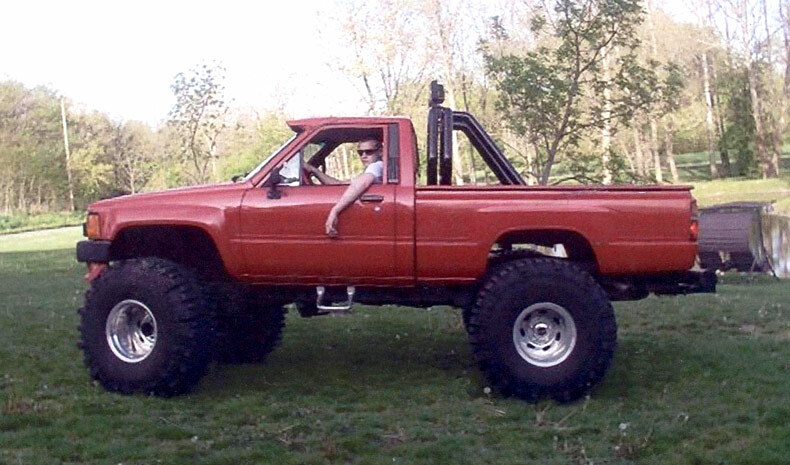 When I bought it it had a regular toyota 4 cylinder in and a 5 speed and well when you would put it in 3rd it would barely hit 50 and then when you would put it in 4th it would fall on its face. And 5 th well there was pretty much nothing there. ...i really think a little truck like this with that big of tires is pretty rare. Thankyou for your time.